Kinder Morgan Inc. (NYSE: KMI) is taking it all in house, announcing plans to consolidate Kinder Morgan Energy Partners LP (NYSE: KMP), Kinder Morgan Management LLC (NYSE: KMR) and El Paso Pipeline Partners LP (NYSE: EPB) into the C-corporation. This blockbuster deal simultaneously enriched shareholders and delivered a punch in the gut to foolish short sellers. The transaction also served as a reminder that larger master limited partnerships (MLP), often maligned for their slower growth and burdensome incentive distribution rights, have a wide range of levers they can pull to unlock value. In recent years, Kinder Morgan Energy Partners has underperformed the Alerian MLP Index amid concerns about its growth prospects and tight distribution coverage. At times, the stock has yielded twice as much as fellow blue-chip Enterprise Products Partners LP (NYSE: EPD). The valuation gap between Kinder Morgan Energy Partners and Enterprise Products Partners didn’t reach absurd proportions until last September, when publicity-seeking newsletter publisher Hedgeye Risk Management launched an unsavory media campaign against the stock that culminated in a hit piece in Barron’s. In this attack, Hedgeye Risk Management warned that Kinder Morgan Energy Partners was a “house of cards on the verge of collapse,” forecast a 50 percent decline in the MLP’s unit price and highlighted the name as its best short idea. These admonitions spooked some weaker hands into selling. Although the incentive distributions that Kinder Morgan Energy Partners paid to Kinder Morgan Inc. effectively raised the MLP’s cost of capital, the partnership still managed to grow its distribution at a faster rate than Enterprise Products Partners–in part because of its lower coverage ratio. Moreover, the Kinder Morgan complex had ample opportunity to kick the legs out from under unsophisticated short sellers, either by reducing Kinder Morgan Inc.’s IDRs or having Kinder Morgan Energy Partners acquire the general partner. Another option would have been for for Kinder Morgan Inc. to take a page out of Energy Transfer Equity LP’s (NYSE: ETE) playbook and acquire another MLP to which Kinder Morgan Energy Partners could sell some of its assets in exchange for unit retirements or IDR relief. Kinder Morgan Energy Partners’ exploration and production assets would have been ideally suited to this strategy. We scrutinized Hedgeye Risk Management’s initial report on Kinder Morgan Energy Partners and published our take on the argument’s shortcomings in a series of articles. Our conclusion: The fear-monger’s allegations that Kinder Morgan Energy Partners artificially boosted its distribution coverage by underfunding pipeline maintenance didn’t hold water. We regarded this pullback as a prime opportunity for investors to buy Kinder Morgan Energy Partners. And in June, we added Kinder Morgan Management to one of the conservatively run model portfolios in Conrad’s Utility Investor. Kinder Morgan Inc., Kinder Morgan Energy Partners, Kinder Morgan Management and El Paso Pipeline Partners’ stocks started to recovery some of their lost value in March. Real vindication for investors, however, occurred earlier this week, when the stocks surged after the announcement of their proposed consolidation into a single entity. Investors in El Paso Pipeline Parkers and Kinder Morgan Energy Partners who opt to take Kinder Morgan Inc.’s offer will incur the same recapture taxes they would face if they were to sell their units in the open market. Management estimates that the average investor in Kinder Morgan Energy Partners will face a levy ranging from $12.00 to $16.00 per unit, while the El Paso Pipeline Partners’ typical unitholder will incur about $4.61 per unit in taxes. Investors who have held these stocks for longer periods will face higher obligations. Investors who hold i-units issues by Kinder Morgan Management have zero taxes to contend with if they opt to take Kinder Morgan Inc.’s buyout offer. The new Kinder Morgan Inc. aims to grow its dividend by 10 percent annually over the next several years from its base of $2.00 per unit. Investors shouldn’t look to the most popular MLPs for value. And given the stock’s 15.6 percent weighting in the Alerian MLP Index and prominence in virtually every fund that focuses on publicly traded partnerships, the stock has become more of a momentum play that fluctuates with the fortunes of the MLP universe. This caveat also applies to Pembina Pipeline Corp (TSX: PPL, NYSE: PBA), a longtime favorite of mine that owns pipelines and other midstream assets in Canada. The company’s second-quarter results reaffirmed the company’s strength, with revenue increasing 36.7 percent year over year and adjusted cash flow from operating activities climbing by 20.4 percent. Meanwhile, Pembina Pipeline remains on track to invest CA$1.7 billion in growth projects this year and announced another CA$460 million worth of new opportunities to pursue. New projects are the lifeblood of dividend growth. The company also boosted its monthly dividend to CA$0.15 per share–its second increase over the past 12 months. Investors have piled into the stock, compressing the dividend yield to 3.7 percent and driving a 25 percent total return year to date. Trading at 21.4 times cash flow, Pembina Pipeline is a hold for investors who already own the stock; however, new money should stay on the sidelines. Take Profits on Big Winners: Don’t be afraid to take a partial profit on any MLP that’s posted big returns and now occupies a disproportionate piece of your overall portfolio. Value and Upside Catalysts: Focus on reasonably priced names with identifiable upside catalysts and buy the popular names on pullbacks. MLPs that recently completed initial public offerings and smaller names can be fertile hunting grounds for investors seeking undervalued names. We covered the former in The MLP IPO Class of 2014, Part 1 and Part 2. Conservative investors should take a second look at MLPs that have fallen out of favor because their distribution growth has stalled. The key is identifying names that should be able to resume growing their quarterly payouts. For example, Buckeye Partners LP (NYSE: BPL) last year grew its distribution after a fallow period and rewarded believers with a 67 percent total return. Our favorite turnaround story for 2014 recently raised its distribution for the first time in two years and has a number of additional levers to pull to drive growth and unlock additional value for unitholders. 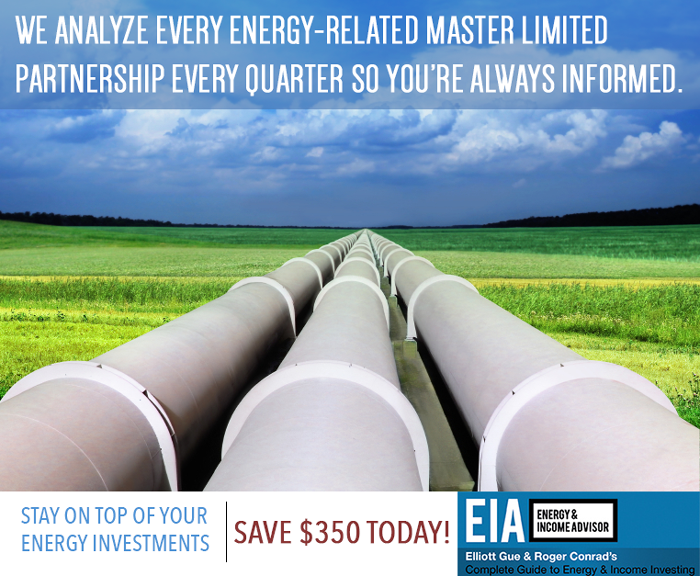 Subscribe to Energy & Income Investor today to learn more about this potential blockbuster.